As a dentist, you probably have purchased at least one disability insurance policy, and you probably sought out “own occupation” coverage. However, in our experience, many dentists do not understand what their policy actually says or realize that there are several variations of “own occupation” policies. Additionally, many of the newer disability policies being sold to dentists have particular requirements and “rules” that must be followed in order to qualify for benefits. Our latest article with Dentaltown Magazine discusses some of these pitfalls and explains why it is important to know what your policy says before filing a claim. Read the full article at Dentaltown today. What should a physician look for in a disability policy? How hard it is for a physician to collect disability benefits? Do I need a lawyer to file a disability claim? What is the disability claims process like? If I have an “own occupation” policy, can I work in a different occupation and still collect disability benefits? What are the most common pitfalls that lead to physician’s claims being denied? Click here to listen to Part 1 of the Podcast: https://www.doctormoneymatters.com/episode44/ and here to listen to Part 2: https://www.doctormoneymatters.com/episode45/. Episodes can also be accessed on www.drmoneymatters.com, and via iTunes, Google Play, Stitcher and other podcast platforms along with Facebook and YouTube. Dentists have a high likelihood of filing a disability claim at some point in their career, which is not surprising given the unique demands of the profession. 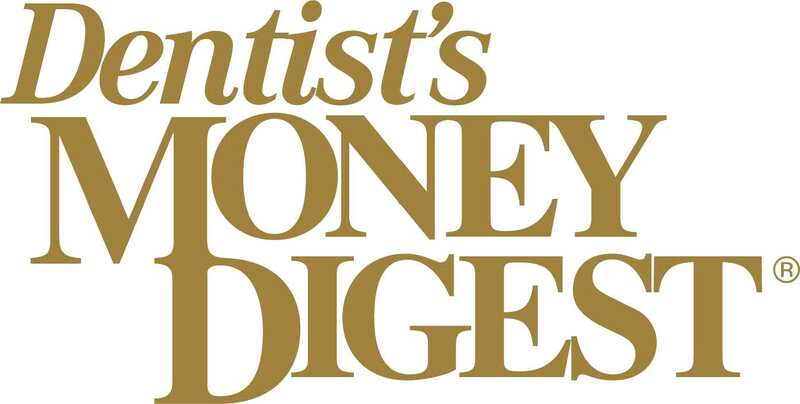 Comitz | Beethe attorney Derek Funk’s article in Dentist’s Money Digest discusses what dentists should look for when reviewing new or existing policies and what to expect when filing a disability claim. Read the full article at Dentist’s Money Digest today. Can You Collect Disability Benefits For Burnout? Physicians experiencing burnout can put both themselves and their patients at risk if they continue to practice. However, it is important to recognize that there are several degrees between ordinary stress and fatigue and a disabling condition, and where you fall on that scale is something that your insurance company can (and likely will) misconstrue, if you are not precise when reporting your claim. Comitz | Beethe attorney Derek Funk’s article in MD Magazine discusses some of the challenges faced by physicians who file disability claims due to mental health conditions and limitations. Read the full article at MD Magazine today. Ed Comitz and Mike Beethe, the founding members of the firm, have both been named Southwest Super Lawyers for 2018. This is the seventh consecutive year that Mr. Comitz and Mr. Beethe have been recognized by Super Lawyers for excellence in their fields, insurance coverage and real estate, respectively. Super Lawyers is a rating service of outstanding lawyers from more than 70 practice areas who have attained a high-degree of peer recognition and professional achievement. Only 5% of attorneys in the Southwest receive this distinction. The selection process is comprised of independent research, peer nominations and peer evaluations. 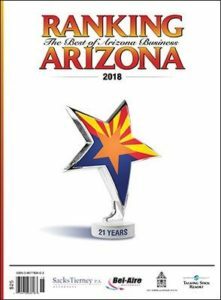 Comitz Beethe is proud and honored to announce we have been named Arizona’s #1 Law Firm for Best Workplace Culture and the #2 firm in both Healthcare Law and Firm with Under 22 Lawyers by Ranking Arizona: The Best of Arizona Business. 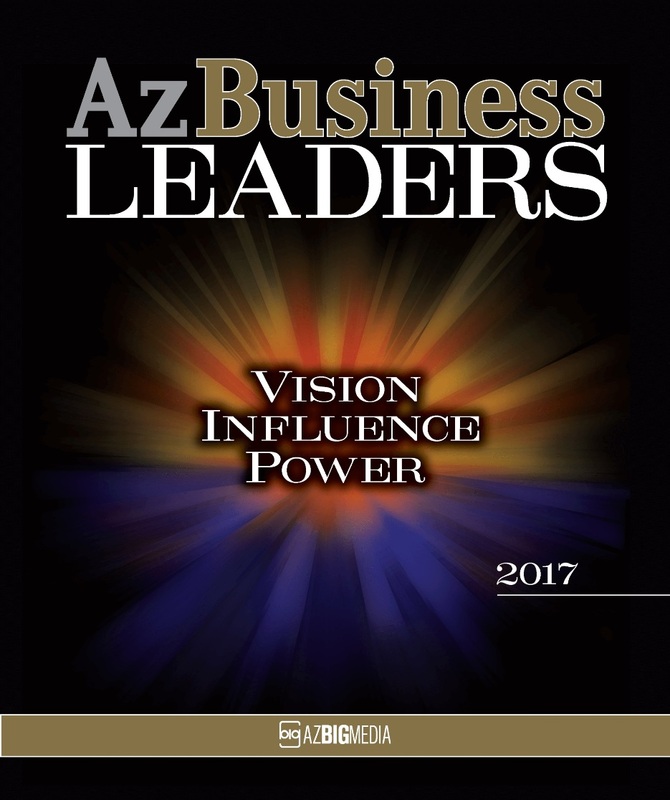 Ranking Arizona publishes the results of the largest annual poll of the Arizona business community. Residents are asked to share their opinions of the best products, services, and individuals in the state. We’ve earned this distinction through the development and execution of studied, meticulously considered strategies aimed at obtaining optimal results for our clients. We have also remained a small firm in order to encourage the sharing of ideas and information in an environment fostered by mutual trust. We pride ourselves on recruiting only the top attorneys in education, skills, and temperament. We offer dentists, physicians, and other professionals compassion, thoughtful and meticulous legal representation, and are dedicated to making the claims process as painless as possible for each client. 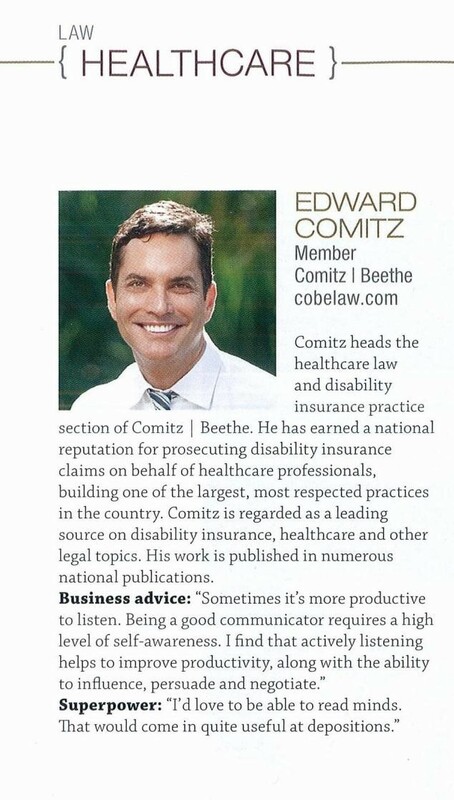 Comitz Beethe offers unparalleled strategy, advocacy, and adaptability. Our clients have immediate attorney access, including their direct telephone lines and emails. Each case has a minimum of two attorneys and a paralegal working on it, with senior partners directly involved in developing each case. Comitz Beethe’s keen legal, medical, and disability industry insight allows us to know what really matters in a case, and we are able to leverage this experience to deliver success. We are pleased that our dedication has earned us this recognition for both our legal expertise and our firm’s collaborative ethos, which allows us to work together tirelessly in order to exceed our clients’ most optimistic expectations. 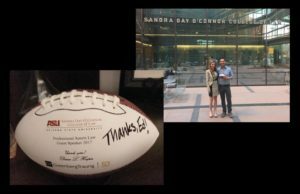 Ed Comitz was recently asked to speak at ASU’s Sandra Day O’Connor College of Law by Greenberg Traurig partner and leading sports agent, Dana Hooper, to address the key issues that professional athletes and their agents may encounter when dealing with disability insurance. Topics included the types of insurance coverage most often purchased by professional athletes, the tactics insurance companies use to deny athlete’s claims, and the importance of an attorney and/or agent’s role in the disability insurance context. The seminar also discussed the pros and cons of loss of value coverage for college athletes expected to go pro, and examined some of the challenges faced by injured athletes seeking to prove that a pre-draft injury caused them to fall in draft order and miss out on securing an upper-tier contract. Mr. Comitz has represented high-earning professionals for nearly 25 years on the toughest insurance cases. As a result, he is intimately familiar with the disability insurance industry, and uses this knowledge to assist athletes from the “big four” sports (NFL, NBA, MLB, and NHL) seeking to negotiate favorable contracts with the premier, high-dollar insurance companies. He also advises professional athletes regarding the types of provisions to avoid in disability policies, the significance of the questions asked on disability insurance applications, and the importance of carefully reviewing insurance applications to ensure that they are accurate and do not provide the insurance company with any basis for voiding the policy, should a claim need to be filed later on down the road. When athletes are approaching free agency and intend to test the market, Mr. Comitz helps the athletes assess whether they need to purchase insurance to protect anticipated future income, should they suffer a serious injury before they are able to secure a contract with a new team. He also assists athletes with the legal issues that arise when an athlete is out for a few games, or an entire season, due to health concerns, and represents star athletes who have suffered a career-ending injuries and need to collect permanent disability benefits. North Valley Magazine has named Comitz | Beethe’s Derek Funk as a Top Valley Lawyer for 2017. The list was compiled using a third-party attorney ranking system and showcases only 35 of the area’s leading attorneys. 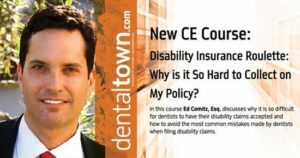 Ed Comitz’s Continuing Education course “Disability Insurance Roulette: Why is it So Hard to Collect on My Policy” is now available through Dentaltown. This CE is an electronically delivered, self-instructional program and is designated for 2 hours of CE credit. In this course, Ed discusses why it is so difficult for dentists to collect disability benefits and how to avoid the most common mistakes made by dentists when filing disability claims. Ed also covers the key provisions to look for in disability insurance policies and provides an overview of the disability claims process. Finally, the course discusses how disability insurance claims are investigated and administered, and identifies common strategies used by insurance companies to deny claims. Information on how to register can be found here. For more information regarding what to look for in a policy, see this podcast interview where Ed Comitz discusses the importance of disability insurance with Dentaltown’s Howard Farran. Ed Comitz and Mike Beethe, the founding members of the firm, were both recently named Southwest Super Lawyers for 2017. This is the sixth consecutive year that Mr. Comitz and Mr. Beethe have been recognized by Super Lawyers for excellence in their field. Super Lawyers is a rating service of outstanding lawyers from more than 70 practice areas who have attained a high-degree of peer recognition and professional achievement. The selection process includes independent research, peer nominations and peer evaluations. 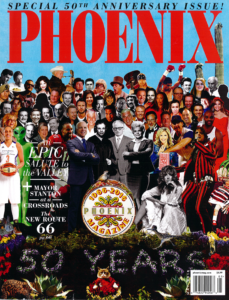 Ed Comitz, one of the firm’s founding members, was recently named as a Top Lawyer in the field of insurance law in Phoenix Magazine’s special, 50th Anniversary Issue. Mr. Comitz’s practice primarily focuses on helping physicians and dentists secure private disability insurance benefits. Mr. Comitz and the legal team at Comitz | Beethe also represent doctors in several other areas, including practice transitions, employment law, business litigation, estate planning, regulatory compliance, and licensing issues. 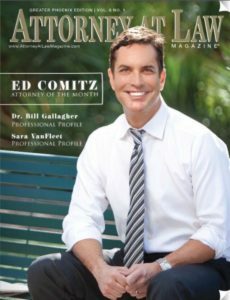 Attorney at Law Magazine recently featured one of the firm’s founding members, Ed Comitz, as its “Attorney of the Month.” Go to Attorney at Law Magazine to read the full interview and learn about Ed’s unique niche, how he manages the disability insurance practice section, and why he decided to advocate for physicians and dentists filing disability insurance claims. Comitz | Beethe Associate Karla Thompson recently spoke with Geoff Williams, a journalist for U.S. News & World Report Money, about common mistakes consumers make when they file insurance claims. If you’re a conversationalist and enjoy talking, be careful. Karla Baker Thompson is a Scottsdale, Arizona-based insurance attorney who specializes in representing professionals with disability insurance claims. Thompson offers the example of a claims handler asking what you’ve been doing that day. “If you say you went out to pick up a prescription, you’re not just making small talk. You’ve just led that claims adjuster to believe – whether accurately or not – that you’re capable of leaving the house, getting in your car, driving, filling out paperwork, and possibly lifting and carrying bags,” Thompson says. Maybe, Thompson adds, someone drove you to get that prescription, or maybe you did go out yourself but you came back and felt miserable afterward. Other examples in the article include assuming your insurance company is right and not getting the proper documentation to support your claim. Check out the article in its entirety to learn more: Don’t Make These Mistakes When Filing an Insurance Claim. Dentists are particularly at risk for disability due to the strenuous nature of their job. Dentists are also some of the most likely to keep working through the pain–even if they shouldn’t be. Our new article in Dentaltown Magazine explores how working through chronic pain can affect dentists in their personal and professional lives. Read the full article at Dentaltown today.